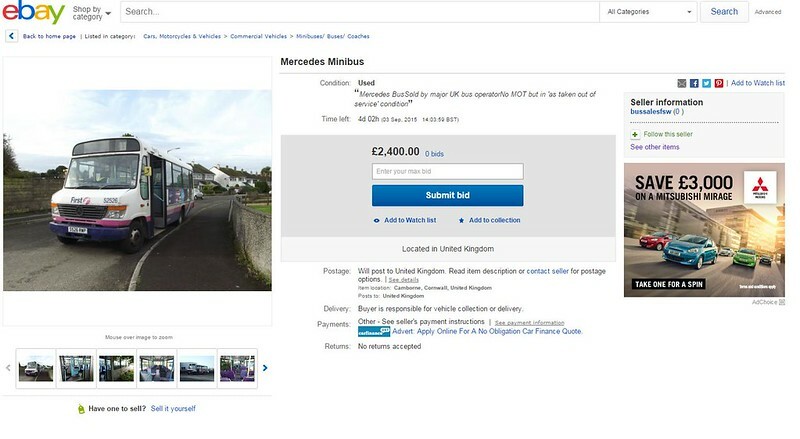 First Devon & Cornwall have placed one or their Mercedes Vario minibuses on Ebay You have a few days if you are interested! First South a West Ltd to be pedantic! £2.4k is a little steep, I feel! The notices on bus stops telling passengers about the imminent withdrawal of services begin 'First Devon and Cornwall ......' Does the company know its own name or not? On the 76 route, First have already taken down all their timetable framed - and put notices in the few, such as the on the 79 route opposite my house, telling passengers about the withdrawal. Talking of bus stops, who designed the new, anaemic green flags for the stops within Plymouth? Presumably someone in the City Council as I believe they provide the stops. The red or green ones, based on the London shape of flag and pole, have a reasonably uncluttered and very visible design, whereas the new ones, on a flat metal plane, are, well, anaemic. As far as im aware it doesn't become First South West until September 6th when the Devon operations close. Legally the company name changed on the 6th August but VOSA hasn't yet processed the change of name, so the discs haven't been replaced yet (assuming new ones will get issued) and presumably that's why the legals haven't yet been altered either. They'll have to change the legal lettering soon as the address will also be incorrect in a week's time. Anyone been to the Midlands and seen the two "Midland Red" heritage liveried buses 'First Wyvern' (or whatever they're called this week) have done? Very pretty they are. If you have, did you notice the legal lettering on the sides? The single decker gets it right: First Midland Red Buses Ltd, with a Chelmsford address (not New Writtle Street, that's now housing). The double decker, on the other hand, has legals for a company called First Midland Red Bus Ltd, also at the Chelmsford address. Strikes me as strange that a company can't even get its own legal identity correct. p.s. All you First-haters: just wait until you've had Stagecoach for a few years. Stagecoach are great if you're in a profitable area. If not - well, take a look at what they're doing with the East Midlands fleet at Lincoln depot. That's what Plymouth will likely be in a couple of years if they can't make oodles of dosh!